So what exactly is DTMF? According to Wiki, Dual-tone multi-frequency signaling (DTMF) is an in-band telecommunication signaling system using the voice-frequency band over telephone lines between telephoneequipment and other communications devices and switching centers. DTMF was first developed in the Bell System in the United States, and became known under the trademark Touch-Tone for use in push-button telephones supplied to telephone customers, starting in 1963. DTMF is standardized by ITU-T Recommendation Q.23. It is also known in the UK as MF4. Touch-Tones or DTMF slowly replaced the Rotary Dial phone after November 18,1963 when the first touch-tone phone was made available to the public by AT&T who held the trademark from September 4, 1962 until March 13, 1984. 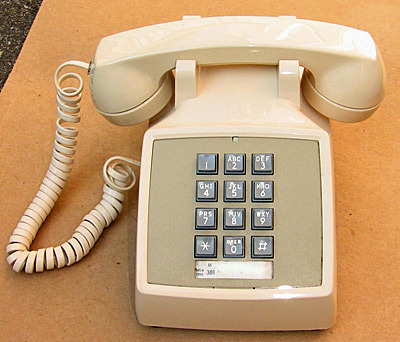 After the touch-tone phone was released, it took a while for it to be common place and was often viewed as a status statement if you or your family had a touch tone phone. With the release of the touch-tone phone, another change came about. It made the normal use of an operator, less and less needed to make calls because with the touch-tones it could be automated. In the early days of DTMF phones, there were six extra buttons on a phone that four out the six are not on it any longer. There use to be an A,B,C, and D button on touch tone phone. The engineers at AT&T had envisioned telephones being used to access computers and automated response systems, so after consulting with companies the #(pound) and *(Asterisk) buttons were added. The A,B,C and D buttons were used to access different menu options, but was later replaced with just a numerical value to replace them so these four buttons were removed. So enough about the phone system part of it, let’s move on to our side of things. In amateur radio there is several things that you can do with DTMF. Probably the most common use of DTMF is remote control. I’m not talking about things like remote control airplanes or cars, but rather other radio equipment, like repeaters. On some repeaters, you can remotely program them to do different things. You can turn the repeater itself on and off, turn the CTCSS tone on and off, change the repeater tail or tail length. Some repeaters the only way you can program them is over-the-air, others you have to do on sight. Shortly after my father, KC5PWQ, and I started the Texas Adventist Emergency Communications club to help Adventist Community Services in times of disaster, he bought a local repeater that had been only working part of the time. This repeater was a GE repeater with a controller that I can’t remember off the top of my head. I remember several times while he had that hardware, having to reprogram it for whatever reason. Thankfully at the time I had a hand-held radio that had big buttons on it. The radios that I have now are a lot smaller, therefore, have smaller buttons and they really would have been a pain with my fat fingers! It also comes in pretty handy if you have some kind of malicious communications going across your repeater. You can just key up, punch a few buttons and your repeater will no longer repeat everything it hears until you turn it back on again. We had a guy that did this to us one time. For about a week, he would key up on the radio and start cursing or playing music or something like that. Even though the repeater owner is normally immune to fines because of stuff like this, no body wants to hear that crap, so just turn it off! Another thing that you can do with DTMF, is things like an Auto-patch. For those of you that don’t know what an auto-patch is, it is a device that connects the over-the-air world with the phone system. Some repeaters have auto-patches built into them. If you witness an accident on the road somewhere and for what ever reason, your cell phone doesn’t work, you can key up your radio, punch a few buttons and call 911. If you are on your way home from work and you want to order a pizza, guess what, you can do that to. While I was in college, I didn’t have a cell phone the entire time and didn’t have a land line phone either. There was a local repeater that had an auto-patch in it and it came in so handy to order a pizza or something like that. You can also have a simplex auto-patch. You can buy the hardware for around $160 from Hamradio Outlet. The limitations to the simplex auto-patch versus one in a repeater is that you range is going to be severally shorter in most cases. Unless you are lucky enough to have a 200+’ tower, in a nice high spot, your probably will be limited to about 5-10 miles depending on the terrain around you and your house or where ever your auto-patch is. Kenwood has a system called Sky Command, at least they did at one point on some of their radios, I don’t know if they do anymore. On the mobile radios that I have, you can turn on this mode and control the radio with a hand-held or other radio over the air. Each button on the DTMF keypad had a different function: Change Channel, Change Power, Turn Tone on or off, etc. I know this function was on the TM-733 and on the TM-742 I believe as well, which Kenwood still makes. They also had it on a couple of hand held radios like the TH-79a. These radios made for good remote base radios on like a link system or beacon or something like that. You could even do it as an emergency cross band repeater. You could take this radio to a nice high spot somewhere in the area that you are working and turn on the Sky Command feature, as well as the crossband repeat. For those that don’t know what the cross band repeat function is, it is basically like a regular repeater, except that your transmit and receive frequencies are on two different bands, normally 2 meters and 70 cm. You have to have a radio that has dual receive capabilities to use this though, because you have to be able to hear and talk without really pressing more than just the Push-To-Talk(PTT). Set your hand-held to transmit on 70cm and set your 2m side to the frequency that you should be receiving on. When you press the PTT button on your hand-held, you transmit on a 70cm frequency, the mobile radio that you have set to cross band repeater, receives the signal and rebroadcasts it on the 2m frequency that the units in the field use to hear on. Using this feature, you can increase your area of operation from a few miles, if you just use simplex on hand-helds, to 10-20 miles depending on the terrain you are working in. This last thing that you can do with DTMF, I’m not exactly sure if it can done in modern radios. I’m sure that it probably can be, but since the radio that I have is no longer in production and I don’t have a current radio, I can’t say for sure. Shortly after I got my license, there was several of us that were all about the same age, around 16 or so. We would all hang out on simplex and each of would talk at different times. At night, we would all turn on a DTMF decode function on the radios where our radios would remain silent unless a certain DTMF code was heard. Each of us, had a different code setup in our radios and we setup each others codes in the DTMF memory that is built into the radios. We kind of used them as like Fire Pagers. Whenever one of us would want to talk to the other, especially at night, we would type in the certain code before we talked and it would open the speaker of the person we were trying to talk to so that they could hear us. It kind of made it like having a CTCSS code set on your radio, but had a little more flexibility for multiple people in one group. If everyone wants to hear everyone else, they can just turn off their DTMF code but if one person doesn’t want to talk any longer, turn on their code and silence is golden. I don’t know if I mentioned this already but DTMF is actually a mixture or two tones when you press a button. Below is a list of what the code are and if you click on the numbers, you can actually listen to the tone, if you want to. I guess that about wraps it up for this post. If anyone knows of any other uses for DTMF or has questions about it, please leave them below in the comments. Before we end, I would like to apologize to all my readers for the unstableness of my blog as of late. I know I have explained what’s going on already, but I wanted to reiterate. The way that my page is set up, using a hosted site for another site that I administer, I am limited to 250 mbs per 24 hour period. As of late, I have been hitting that mark when I post a new post, so I am having to change-up my hosting plan. I am hoping that today, I will be able to start my move to my new host and this will all be a not so fond memory of the past. So please bare with me and continue to come back to my site. As always, please subscribe to my blog through email or RSS feed, like me on Facebook and follow me on Twitter, Google+, and LinkedIn. Linked to all of these can be found on the sidebar.